“Whiplash” is an acceleration-deceleration injury that occurs most commonly when the patient is rear-ended in a motor vehicle accident. Acute hyperextension occurs causing injury to anterior soft tissue structures of the neck, including the anterior longitudinal ligament, the intervertebral disk, the strap muscles, longus colli, and sternocleidomastoid muscles. When the vehicle decelerates, the head recoils into flexion, causing injury to the facet capsules, posterior ligaments, and paraspinal musculature. 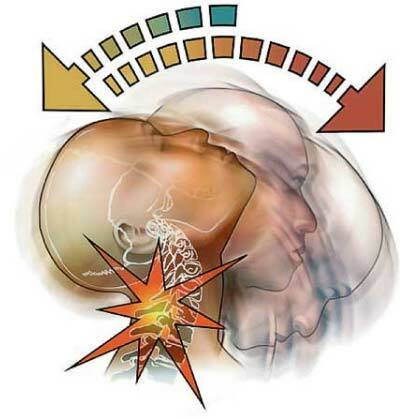 Analgesics, rest, and immobilization in a soft cervical collar until the pain is controlled, followed by gradual mobilization. Physical therapy exercises are initiated when range of motion normalizes.